BiPAC 7800NX, 3G/4G LTE Wireless-N ADSL2+/Fibre Broadband Router, is a fibre-ready triple-WAN ADSL2+ modem including Wireless-N 300Mbps, Gigabit Ethernet, 3G/4G LTE, and NAS (Network Attached Storage) in one unit. It comes equipped with the latest high throughput VPN technology to fit the needs of SOHO and office users. 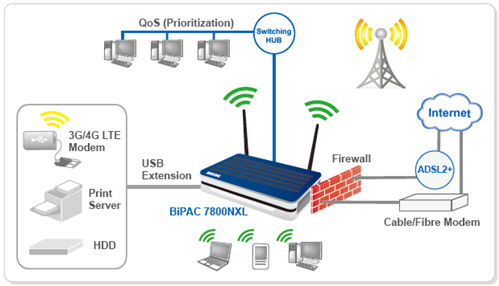 As well as being IPv6-capable, BiPAC 7800NX ADSL2+ supports superfast fibre connections via dual-WAN connectivity through a Gigabit Ethernet WAN port. The USB port can host a 3G/4G LTE modem connecting to the 3G/4G LTE network for Internet access. headquarters and branch offices. With a built-in DES/3DES VPN accelerator, the router enhances IPSec VPN performance significantly. With the BiPAC 7800NX, you can connect a 3G/4G LTE USB modem to its built-in USB port, allowing you to watch movies, download music or access e-mail no matter where you may be. You can even share your Internet connection with others, when away on business, at a show, or wherever there is mobile signal but no fixed line access. The auto fail-over feature ensures maximum connectivity and minimum interruption by quickly and smoothly connecting to a 3G/4G LTE network if your ADSL/fibre/cable line fails. 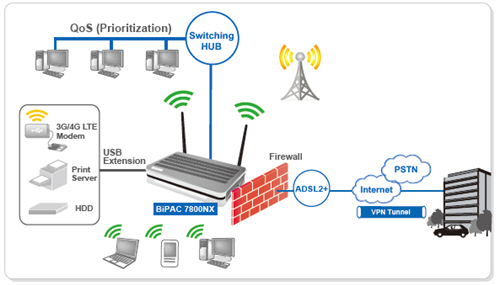 The BiPAC 7800NX will then automatically reconnect to the ADSL/fibre/cable connection when it's restored, reducing connection costs. These features are perfect for office situations where a constant and uninterrupted connection is critical. Also, it has a USB port, allowing the device to act as a print server as well as a NAS (Network Attached Storage) device with DLNA (Digital Living Network Alliance) and FTP (File Transfer Protocol) access. modem. The BiPAC 7800NX again offers users convenience and optimal network performance with data rates reaching up to 1Gbps. deployment) are supported to be adapted quickly to service provider’s IPv4/IPv6 network. 3. Only applicable to Australia and New Zealand. 4. Specifications on this datasheet are subject to change without prior notice.